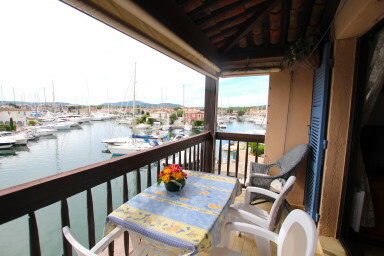 This apartment is located in a private residence close ot the center of Port Grimaud 1. It is on the second floor and is composed of a living-room with a sofa-bed and an open kitchen, 1 small bedroom with a wide double bed and a bathroom. On the canal side, a large balcony so that 4 people can have lunch while enjoying the lovely view. A numbered parking space next to the building. Close to the beach and facilities. A nice well-furnished apartment for great holidays.